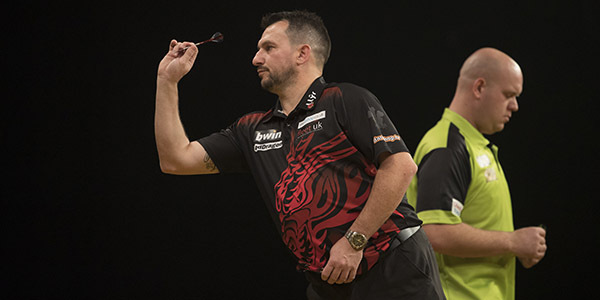 JONNY CLAYTON overcame three-time champion Michael van Gerwen 5-4 in one of the greatest games ever seen at the bwin Grand Slam of Darts, as three players qualified from the group stage on a memorable Sunday in Wolverhampton. Despite Van Gerwen averaging 107.92, and bordering on record-breaking territory for much of the game, Clayton punished the Dutchman's three missed match darts to edge a classic contest and end the reigning champion’s 21-game winning run in the tournament. Clayton now tops Group A, while Rob Cross, James Wade and Gary Anderson became the first players to secure qualification to the knockout stages on a day which saw ten players average over 100 at the Aldersley Leisure Village. "I don't think I'll stop shaking for a week after that one! I'm so happy to have won that game,"said Clayton, who also defeated Joe Murnan in his opening game. "Michael is a phenomenal player but I always concentrate on playing my own game and now I can take massive confidence from that win." Day two of the £450,000 event saw all 32 players in action, with Saturday's winners facing off and Saturday's losers playing each other. The other match in Group A saw debutant Gary Robson produce a stunning turnaround from 4-1 down, surviving two match darts in his 5-4 win over Murnan. A masterclass from UK Open and World Matchplay champion Anderson saw him average 112.54, the fourth highest ever seen at the Grand Slam, in his 5-1 demolition of Ian White. 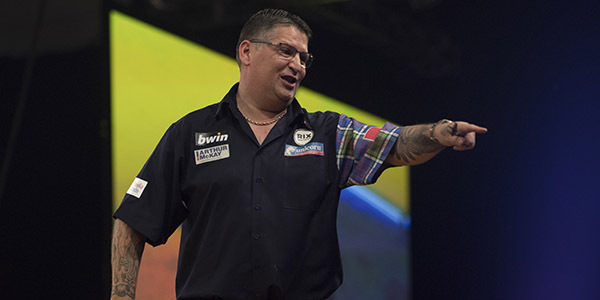 Anderson opened the tie with the first two of seven 180s, and although he missed out on a nine-darter the Scot powered to a second win of the weekend. "I was thinking 'don't hit the nine-darter' because it can all go wrong if you do that!” said Anderson, a former Wolverhampton finalist. "Ian is a great player and a good friend of mine so I knew I had to be at my best to win against a top player." Group D's other tie saw German BDO qualifier Michael Unterbuchner take a big step towards qualification with a 5-2 win over Steve Hine, eliminating the Coventry man in the process. World Champion Cross became the first player through to the knock-out phase after surviving a match dart to beat World Youth Champion Dimitri Van den Bergh 5-4 in a repeat of their World Championship quarter-final. 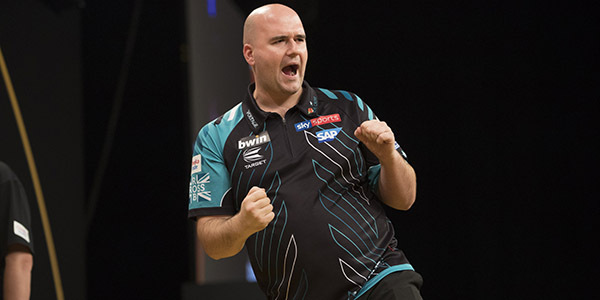 Cross, who missed just two darts at a double, trailed 3-2 to the young Belgian before battling back to force a last-leg decider and, after Van den Bergh missed a dart at the bullseye, the world number three found double eight with his last dart in hand for the win. 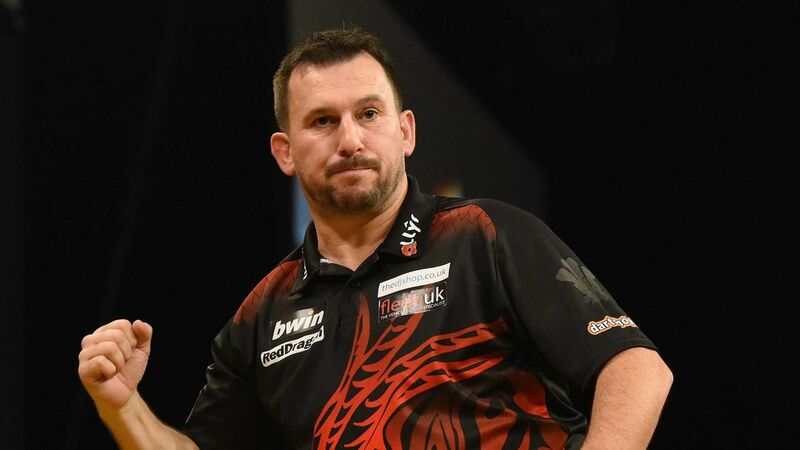 "It's a good feeling to be through after two games and I had to play really well to beat Dimitri, he's a class person both on and off the oche,” said Cross. "I have been feeling the pressure a bit in the last couple of months but as long as I play well for the rest of the year it doesn't matter." Elsewhere in Group H, Ryan Searle's hopes of qualification were ended as he went down 5-4 to BDO number two Mark McGeeney. 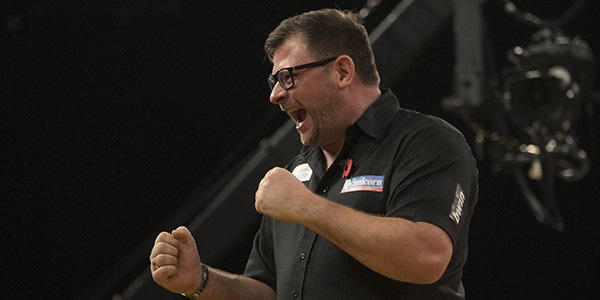 European Champion and World Series of Darts Finals winner Wade extended his winning run on TV to 12 matches with a 5-3 victory over Keegan Brown in Group C.
Wade averaged 104.7 and fired in three ton-plus finishes, including a 101 to win the tie, as he saw off Brown - who averaged 102.1 in an exceptional match. "Of course it's pleasing to get through after two games but this is just the start of the tournament," said Wade. "I always take my opportunities and I think my experience carried me through that one. Now I'm want to keep the winning run going." The other game in the group saw three-time quarter-finalist Mark Webster eliminated following his 5-3 defeat to Dutch BDO qualifier Wesley Harms. In Group E, 2017 runner up Peter Wright also made it two wins out of two as he beat German number one Max Hopp 5-2, while Josh Payne earned a 5-2 victory over BDO number three Jim Williams. Stephen Bunting fired in a 104.36 average as he picked up a 5-3 win over Mensur Suljovic in a high-qualifty Group G affair, and former Lakeside Champion Scott Mitchell recorded a 5-1 rout of German youngster Martin Schindler to keep his qualification hopes alive. 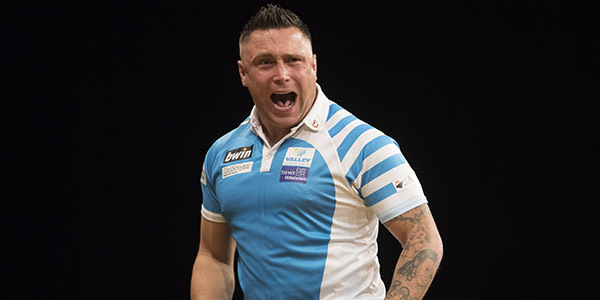 Welshman Gerwyn Price struck seven 180s as he edged past Lakeside Champion Glen Durrant 5-4 in a gripping Group F contest, while superior doubling proving to be the difference for European Championship runner-up Simon Whitlock in his 5-2 victory over Andrew Gilding. Former champion Raymond van Barneveld survived a scare as Adam Smith-Neale missed four darts to dump him out of the tournament, with Group B's second game seeing Premier League finalist Michael Smith produced a top-class 13-dart deciding leg to edge past Krzysztof Ratajski 5-4.